(Nanowerk News) Scientists affiliated with Europe’s Graphene Flagship develop a photodetector that converts incident light into electrical signals on femtosecond timescales, enabling ultrafast operation speeds for electronic circuits in optical communications and various other applications. The conversion of light into electricity underpins a range of technologies that includes solar cells, digital cameras and optical-fibre communications, and in most cases operation speed is critical. For example, lasers currently used in optical communications, medical imaging and surgery can generate light pulses a picosecond (10-12 s) and less in length. Shorten the pulse length by three orders of magnitude, and you have a femtosecond (10-15 s) laser, the fastest currently available. To give you a conceptual idea of the timescale involved, a femtosecond is a thousandth of a millionth of a millionth of a second. 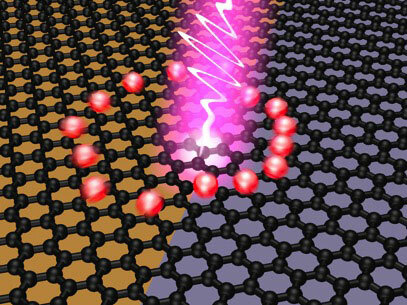 Photovoltage generation through the photo-thermoelectric effect occurs in this case when incident light is focused at the interface between graphene layers with different doping. The process begins with excitation and electron-hole pair generation, and is followed by electron heating from scattering between the charge carriers. The electrons then cool by thermal equilibrium with the atomic lattice, and this takes place on a picosecond timescale, limiting switching rates to a few hundred gigahertz. Much faster, terahertz switching (equating to femtosecond durations) requires the exploitation of carrier heating. Graphene has long been considered a promising material for ultrafast, broadband photodetectors, the performance of which is dependent on switching speed. Efficient carrier heating is what distinguishes the photodetector developed by physicists at the Institute for Photonic Sciences (ICFO) in Barcelona, together with colleagues in the US and Spain. The results of the study are detailed in a paper published in the journal Nature Nanotechnology, the first author of which is Klaas-Jan Tielrooij ("Generation of photovoltage in graphene on a femtosecond timescale through efficient carrier heating"). Led by ICFO professor Frank Koppens, the researchers use graphene to directly measure the duration of a laser pulse less than 50 femtoseconds in length. In doing so, they show that energy from incident photons can be transferred efficiently to charge carrier heat, with a constant spectral response between visible and infrared wavelengths of 500 and 1,500 nanometres. This is consistent with efficient electron heating. The Graphene Flagship is an international academic-industrial consortium, funded in part by the European Commission. One of Europe’s first Future and Emerging Technologies flagship initiatives, the Graphene Flagship focuses on the development of graphene and related two-dimensional materials.